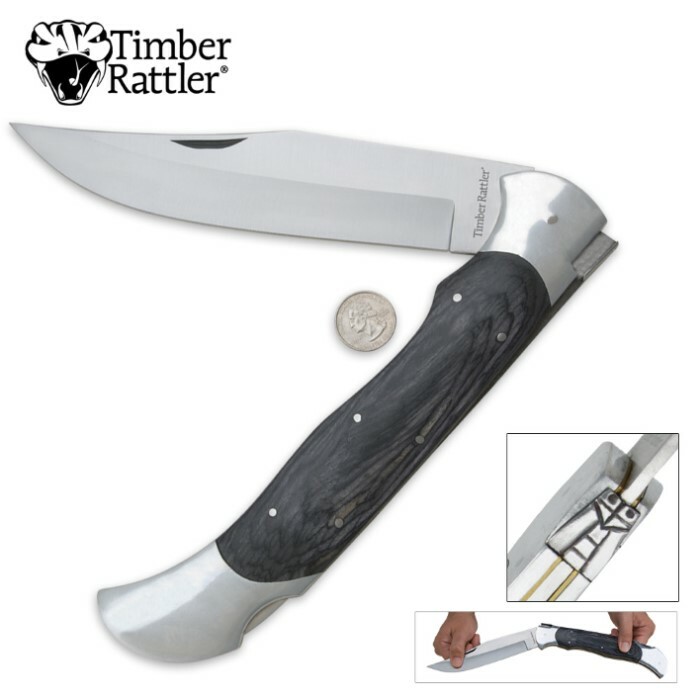 Timber Rattler Scarab Back Giant Lockback Pocket Knife - 8" Stainless Steel Blade, Genuine Pakkawood Scales - 17 3/4" Length | BUDK.com - Knives & Swords At The Lowest Prices! Do you think you can handle this?!? You just thought you had a lockback - THIS IS A LOCKBACK! 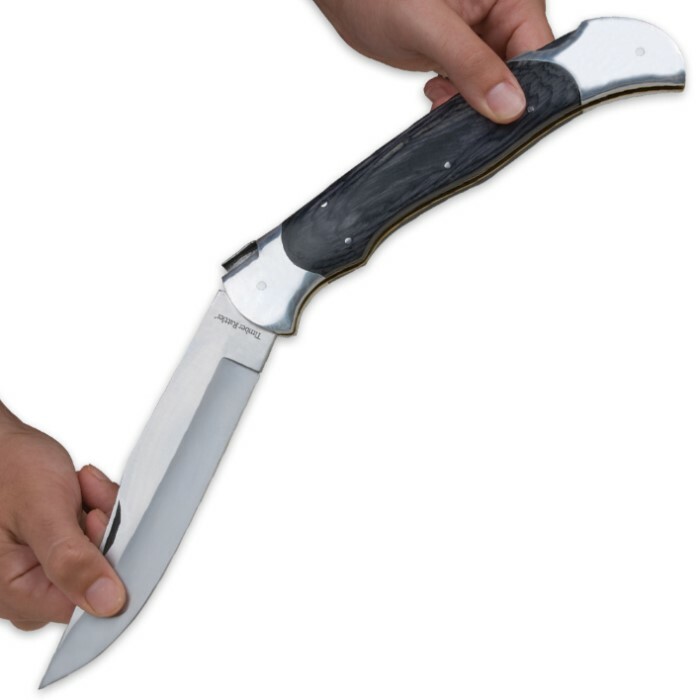 The monstrous Timber Rattler Scarab Back Giant Pocket Knife features an 8" stainless steel blade housed inside a handle with gray pakkawood scales and stainless steel bolsters. A scarab medallion affords character to the back of the knife. Measures 9 3/4" closed and 17 3/4" overall. This is the one thing I give as a gift. I want my friends and family to be safe. How else would you be safe if not with a huge knife. This thing demands respect. When I showed this beauty to my wife, she laughed, so hard! I love knives, and have many! I love my wife, but, can only have one. So, like her, I choose the very best! The handle plates of gray are very will finished, and the blade is sharp. I have pulled it through our kitchen ceramic edge sharpener, which did smooth the sharp edge to a razor one. When you put this knife into your right front pocket, you better have a heavy coin purse in the left one, just to balance the load! Timber Rattler went over the top on this one! Yes, it IS a practical knife, because, it's what you are cutting Cantalope or Watermellon with, at the family outing! Keep your eye on it, because others will covet it! This is the first item I have bought from BudK that has let me down. The lock is completely broken and the blade will not fold back up. The knife itself is great but utterly useless if I can't fold it back up. It is bigger than it looks in the picture. It is just insane. Once opened can wield it two-handed. Is it practical? Who cares!! It is insanely the most groovy thing to be seen. Given the price, the amount of steel & just the sheer awesomeness of the LARGE size of this knife, wood scales, etc, I should probably give 5 stars. But there are so many scratches & nicks, I just can't. It almost seems like 2 people worked on this knife. One side is really good, shiny & flawless. The other side is ground down a lot more & has nicks & scratches all over it. 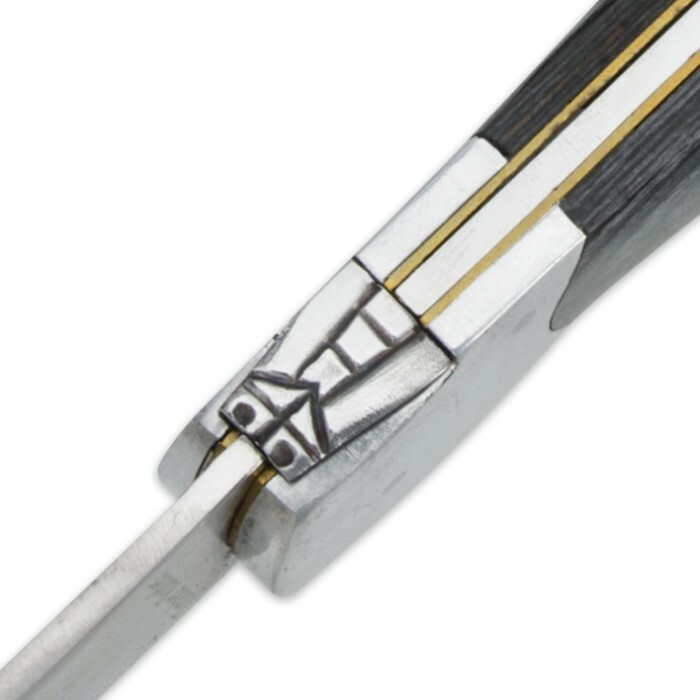 It is not even close to being symmetrical, the blade or the frame. Just seems like laziness and poor handling. Now all that being said, you might think I'm not happy with this knife or would not recommend you to get one. But I am really happy with it, I love it, it's HUGE, it's inexpensive, and I would highly recommend picking one up!! The best way for me to describe is it's FUN. It makes me smile just knowing it's in my pocket. When I pull it out & open it up, it is ear to ear grin factor x10. I see that they have a similar knife in a different pattern for a few more bucks, I'll be getting that one next. If you don't have one of these, GET ONE!!! You won't regret it, even if it just a conversation piece. Thanks for this one BudK, well done!! !